You are here: Home / Travel / Hey mom, I walked on a frozen lake! Just a few weeks ago my mom was telling me it was not wise to walk on ice. Upon arrival I met up with Janna, a super awesome KERF reader, and Laura, a friend of mine from governor’s school (aka nerd camp) who I haven’t seen in 10 years! 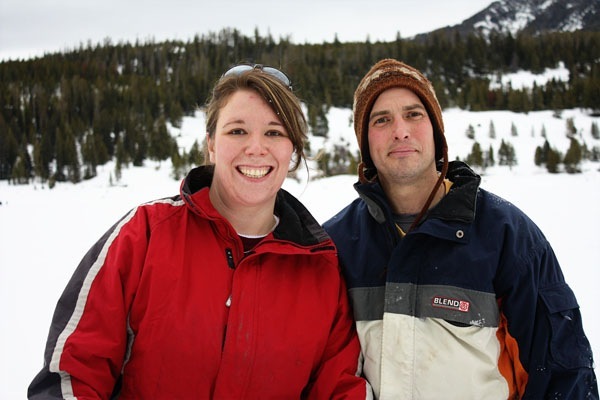 Janna lives in Three Forks and Laura lives in Billings and they came out today with their husbands to take us snoeshoeing. 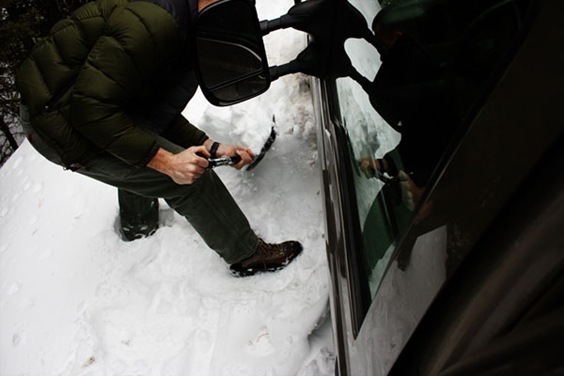 Matt and I rented snowshoes from a nearby store and we were off to the Gallitin National Forest. But despite our super awesome 4WD monster truck, we managed to get stuck along with about 5 other vehicles on this one road. 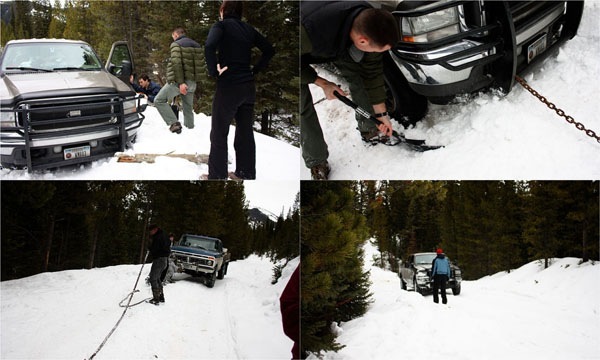 There was some panic, some digging, some cursing and thankfully some help from chains. Eventually we got unstuck but Seth had to BACK down the mountain – it was a bit scary. We girls went for a snowshoe walk while they boys worked. 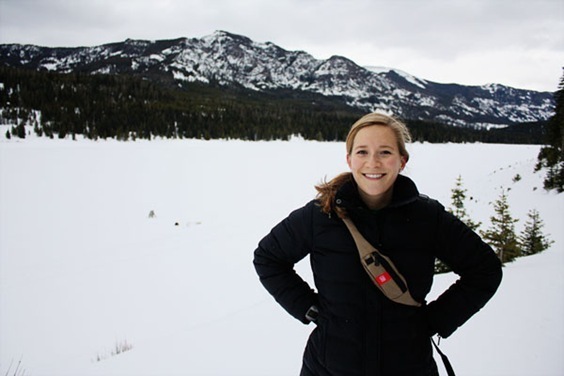 I LOVED snowshoeing!!!!!!!!! Janna saved the day by lending me her super warm waterproof boots. Our shoes were only $10 to rent and were totally awesome. Unfortunately because of our truck incident, we only got to shoe around for about an hour. But it was worth it and really cool. 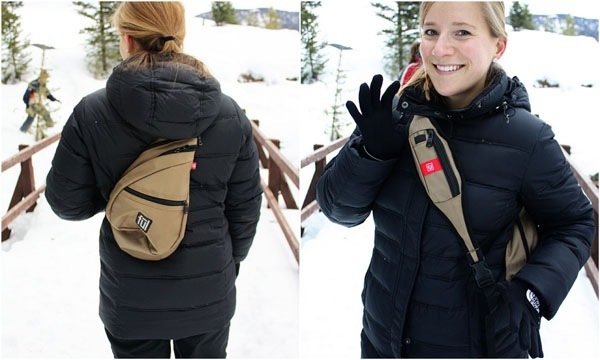 I have to give a shout out to this new OpenSky item coming soon – the Peabody Bag by FUL. It is perfect for outdoor activities! Has a little pocket for cameras or cell phones (or Burt’s Bees!) on the front and is the perfect size for a DSLR camera, phone, wallet and a bit more. It’s also really easy to swing around and access while still wearing it. My new favorite toy!! Also only $19. Two of the colors are sold out, but I’m doing a newsletter flash deal with this soon! We headed down the hill and onto the ice. This was the scary part because I just pictured a lake bank and all the rocks on the side! But look how thick the ice was – almost 2 feet! We were pretty hungry for lunch and guess who downed a beer in 2 minutes flat! The rest of us nourished with trail mix, BabyBel, carrots, hummus, bread and more that Janna brought the group. Thanks Janna!! It was a nice quick lunch. 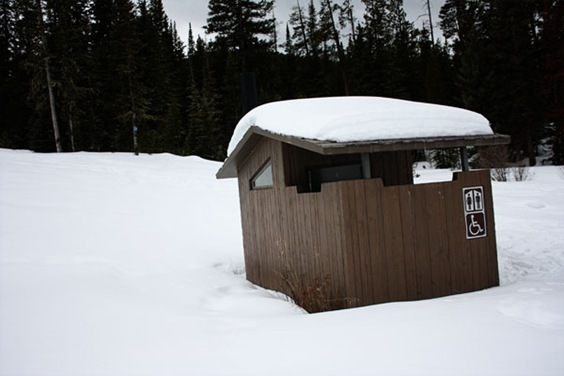 Despite the scary moments, we had a wonderful time exploring Montana snow. Even if it was 40* out! Glad you like snowshoeing! It’s so fun, as long as the temps are bearable outside. how fun! 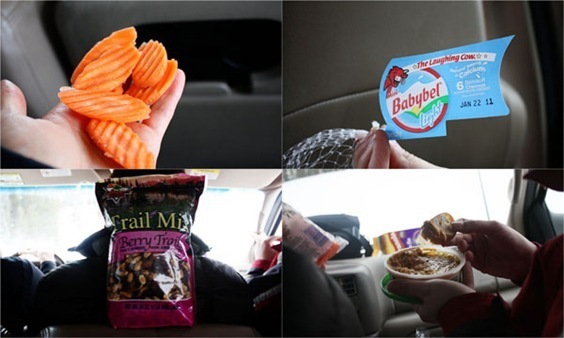 I love eating foods like that whenever im out and about in the snow. Nothing tastes better than trail mix after a good workout! When scrolling down I really thought the dog was a bear for a sec – what a fluffball! Thats fun! Reminds me of up North Michigan. I miss it! Wow it sounds like such a fun day! 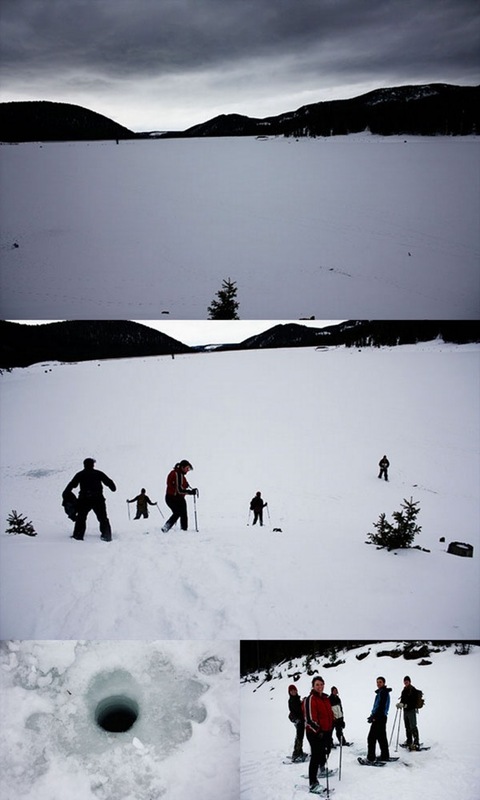 I’ve never been snowshoeing in my entire life but I’d love to go! wow, that looks like a great adventure. 🙂 i love snowshoeing! it’s a great workout too. i love the antlers on the front of the truck. 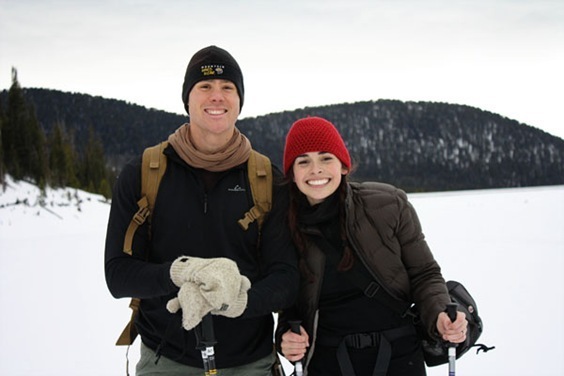 We had a great time snowshoeing with ya! Thanks for dealing with the stuck truck. :) So sad we had to leave early, but maybe we could drink some great local brews the next time we’re in va. Please do come visit us!!! Had a wonderful time. Snowshoeing looks fantastic. I would have been nervous about the frozen lake as well. Two feet, or ten feet of ice! I have a sling like that from Eddie Bauer and it rocks! One of the best purchases I’ve ever made. 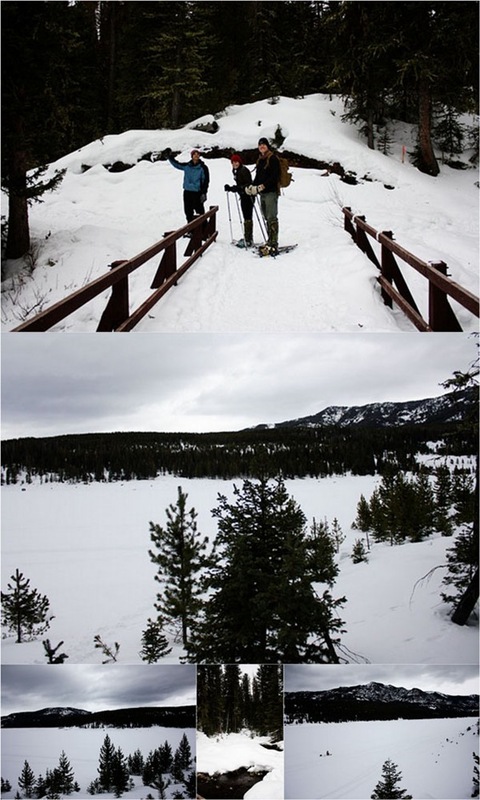 Snowshoeing looks really fun, I think I want to try it out soon. Looks like so much fun! Love the fluffy dog…what kind is it? Too cute! That’s what the owners said! 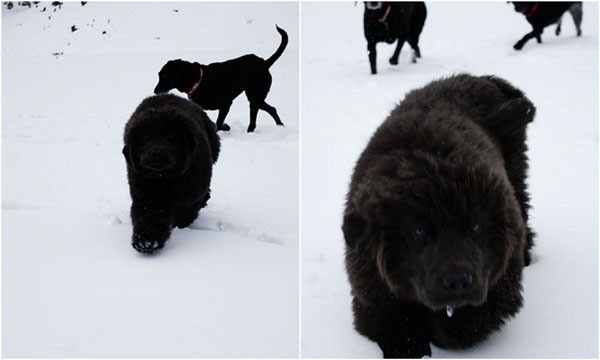 I think I’m in denial that the dog is NOT a bear. Here is the mom in me coming out: where is your hat, woman?!? It was 40 degrees! That’s balmy hat-free weather, especially when snow shoeing. It was 20 today here and I was cross country skiing. My hat was off about 10 minutes down the trail and I was sweating! Beautiful! Winter sports are so much fun. You should give cross country skiing a chance if you have the opportunity. We had a fire on ice one time… I was so scared the whole time that I think I drank 2 bottles of wine… It was fine, and in the morning we went to look and it had only gone through about 2 inches of ice!! Crazy! 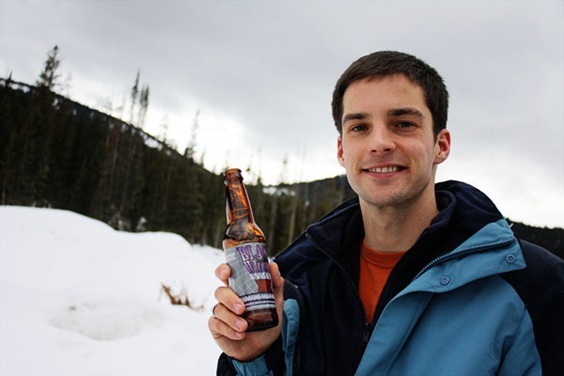 Looks like you had a great day – I bet snowshoeing was a lot of fun and great that you were able to reconnect with an old friend. Too bad the truck got stuck! Oh wow! What kind of dog is that?? And that is why blogging is so awesome! You meet so many people from around the globe! Looks like an adventure today. I hope you are warming up now! 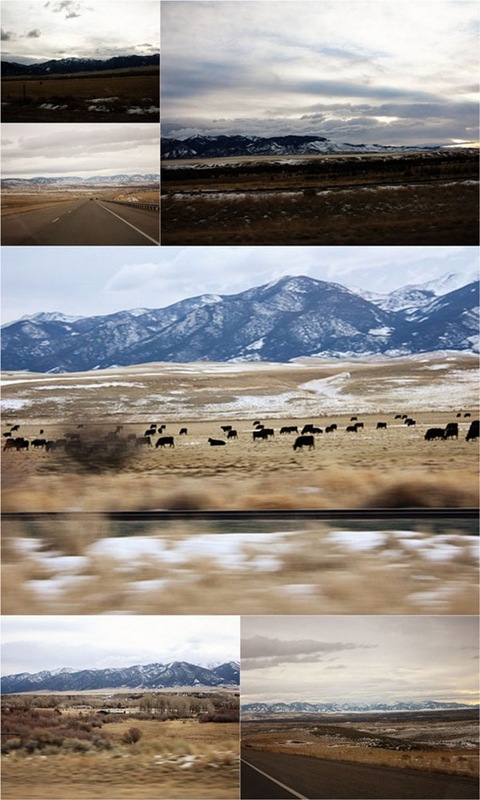 LOVE the photos of the mountains and cows! And that dog is soooo adorable. Looks like a great fun day. 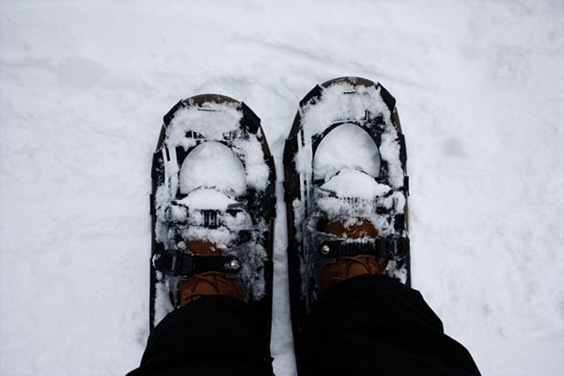 Snow shoeing sounds like fun! 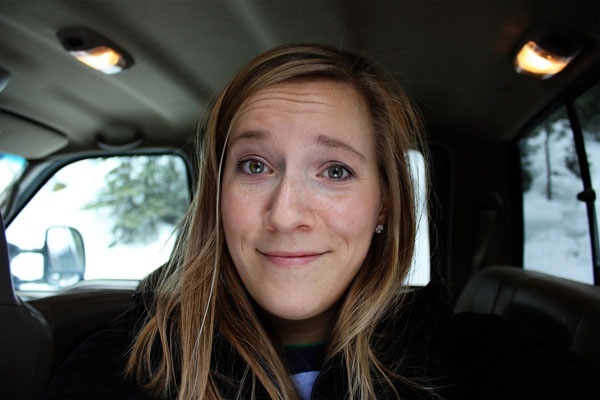 It’s so cool that a blog reader recognized you! a lot of ice is perfectly safe to walk on, skate on….even drive over!! snowshoeing is awesome! i’m so happy i discovered how fun it was a few years ago, because i’m not that into skiing and winters up north are really long, dark and cold when you don’t have fun outdoor activities to look forward to. 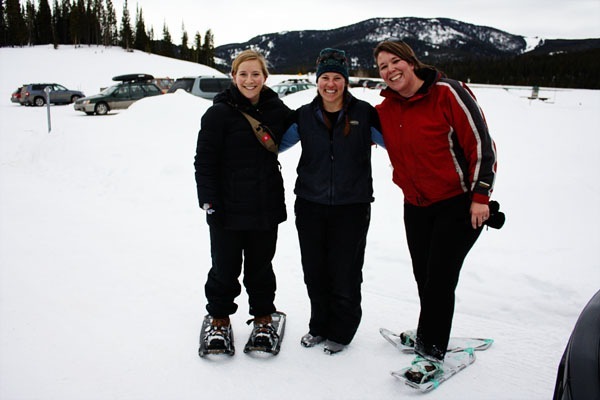 we’re planning a big snowshoe adventure next weekend that might even include renting snowmobiles! i’m pretty excited. Looks absolutely gorgeous–what a fun trip you’re having! Wow! Going across that lake of 2 feet thick ice looks amazing! And I want to grab that dog and give it a huge furry hug. That’s the cutest bear/dog I’ve ever seen. Montana looks gorgeous! And what breed are those majestic fluffy creatures?? That dog is adorable! What a fun, beautiful adventure! In MN, I used to drive to high school over the big lake in our town… it would save 15 minutes drive time! However, I moved there when I was 14, so the whole idea of a well-used road on the lake was foreign and freaky the first couple times! Hope you continue to have great and unusual experiences out there in Big Sky country… Enjoy! omg omg omg that dog is SO adorable. you and matt are also so cute together. oh and in regards to your post a little while ago, the salted caramel cupcake, i think you would adore that from georgetown cupcake. http://www.georgetowncupcake.com/menu.html have a great rest of the trip!! The snow looks absolutely beautiful! When I lived in Sweden, my mom told me I shouldn’t ice skate unless the lake was frozen solid. Note: Lakes don’t freeze solid, haha… it’s safe to skate on 3-4 inches of ice. Isn’t snowshoeing tough! I did it once and it completely exhausted me! I think being “recognized” by a reader would be so much fun. Looks like you had a great day! 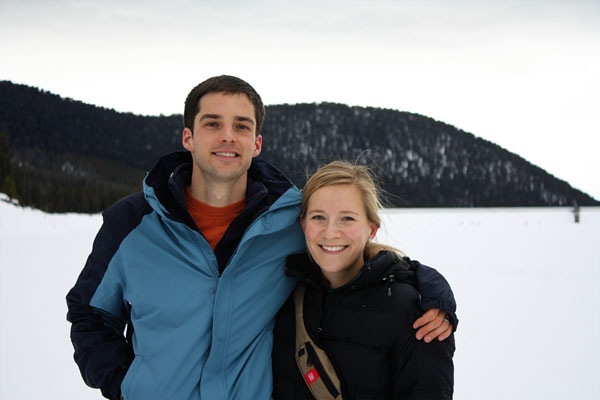 i grew up in MN and walked on plenty of frozen lakes too! 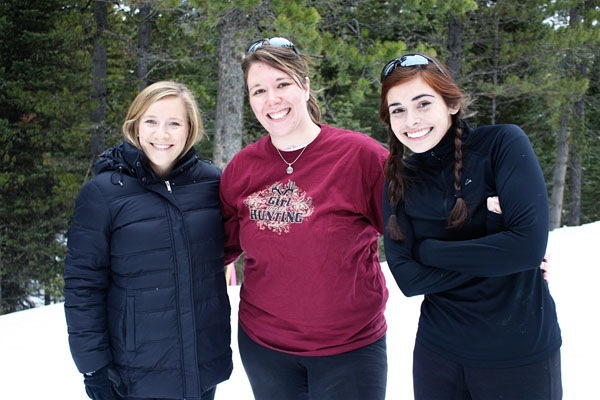 Yay snowshoeing – so fun! 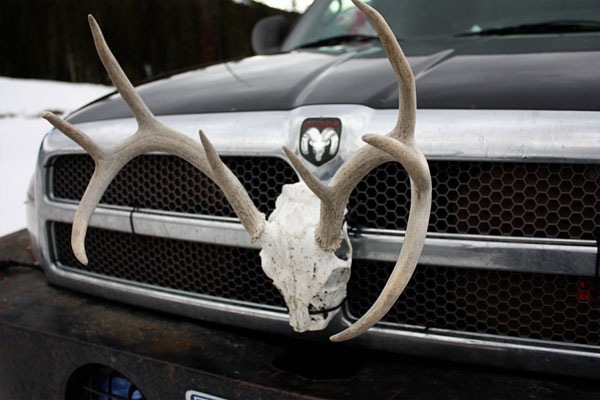 Love all your photos of Montana. That sling bag looks great! I could really use something like that, so I’m happy you blogged about it. I’ve never tried snowshoeing but I’m really intrigued now. Plenty of snow here in WI to do so, just need to see if there are any snowshoe rental places around. I do not comment often, but you have a wonderful way of telling a beautiful story about your life Kath. It’s so fun to read about! I have you in my google reader and I always save your blog for last. I’m a big believer in saving the best for last! What an amazing day in the snow! I’m from Minnesota, and yet I’ve never actually gone snowshoeing. I’m jealous. How cool! I’ve always meant to try snowshoeing, but we usually end up skiing instead since we already have the equipment. Plus I’d like to save it for a a place with a sweet view like were you were! Which Governor’s School did you go to? I went to East! SO much fun! 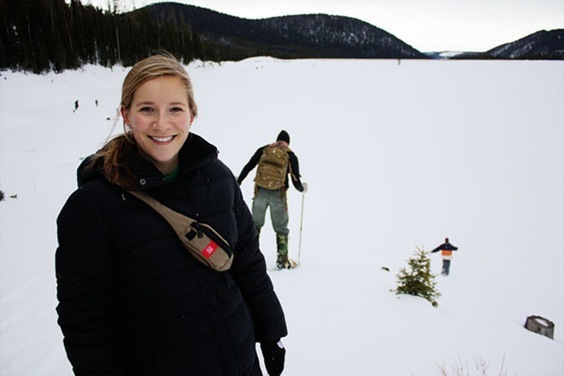 Snowshoeing looks fun – but so hard! I have a hard time lifting my boots in snow haha! Oh gosh, it’s so weird to be reading this post while sweltering in Canberra’s 90 degree heat! Mind-boggle-time! I went snow shoeing today for the first time, too! I was surprised at how much of a workout it was. I hope you don’t mind me saying…but your husband is cute!! Gosh that looks amazing. I totally want to go snowshoeing now! I love snowshoeing! It sounds like it would be so boring but is actually so fun! What breed of dog is that?! He’s huge!! Looks like you guys had a blassssssssst! Now I wanna go snowshoeing even more!!! 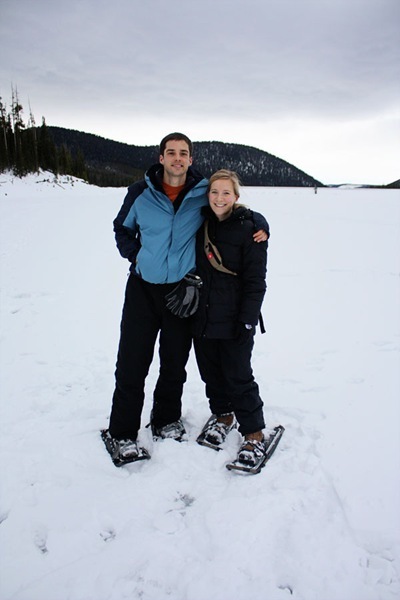 I’d love to try snow-shoeing sometime, but omg, you could not get me to walk across a lake! and I definitely thought that dog was a bear at first glance! I’ve been snowshoeing a few times before and it’s SUCH a workout. My legs always ache the next day!! Hey thats a really pretty view!! oh, and i love the “bears”….. to cute!!!!! Hey Jennifer!!! We talked about you – hope things are good! Love this post and all the great pictures! Looks like it was such a fun day! Nice! I was a governor school nerd too! ‘Governor’ was a word that I lost the 3rd grade spelling bee to. The sad news is I still can’t spell it. ahh gorgeous pictures! I’ve always wanted to go there. Curiosity’s killin me what kind of breed is that dogbear?! I want to try snowshoeing this season….. I have that type of bad as my purse. It’s the best ever. I’ve had it for a year and I am not sure if I’ll go back to a regular purse. This is a great entry! 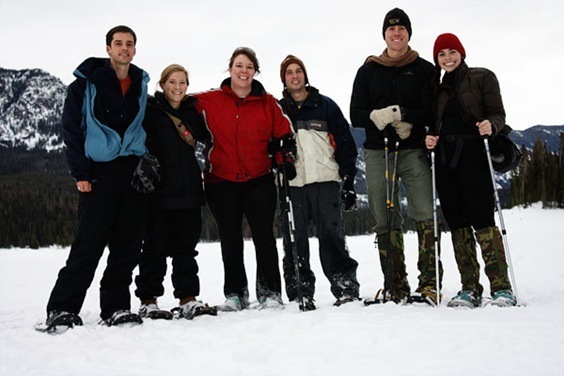 The snowshoeing looks like so much fun, and I love the random KERF sighting! Awesome! I love snowshoeing. We finally bought our own pair this year–which has been the best decision ever! Now we can go whenever we want and they are sooo much better than the shoes we used to rent.